One of the games that I drooled over until I convinced my friend to buy it (thanks!) was Blood Bowl: Team Manager. In Blood Bowl, each player starts with a team representing his race, and attempts to gain the most fans. The season consists of five weeks, and in each week there are a certain number of "highlights" which the players compete over. (Terminology gets confusing here. So, along with the game's instructions, I will call you (the player/reader) "managers", and the cards you play are "players.") Managers (you) take turns placing a single player next to a highlight that is either empty, or where they have already placed a player. When placing a new player, that player may be able to gain the ball, cheat, [attempt to] tackle his opponent [sometimes ending in falling on his face], and sprint. Once all of the managers have placed all of their players, all of the cheat tokens are revealed (which could help players, but could also get them ejected). Now, whoever has the most "star points" at each individual matchup wins the prize - but each manager collects a smaller prize for every matchup where he had players. These prizes can be Star Players, Team Upgrades, Staff Upgrades, or Fans. These upgrades can be used in all of the following weeks of the season (so it is best to get them at the beginning of the game). Play consists of five weeks, and at the end of the game, whoever has the most fans is the winner (just like in real sports - whoever has the most fans is the real winner, because they make tons of money regardless of if their team actually wins any championships). The first thing that I love about Blood Bowl is the ability to upgrade your team. I'm that guy that loves sports simulation games, but doesn't actually play the actual games in them. I'll buy Madden and play Franchise mode - simulating all of the games, and just enjoying the trading, drafting, etc. that goes into running the team. I loved Football Mogul, and have played similar games for baseball, football, soccer, etc. This is really what appealed to me the most about Blood Bowl. The back of the box made me drool! I'm not a huge fan of improving your team in a deck building fashion, but it doesn't really detract too much from the game for me - especially since your new "Star players" are always placed on top of your deck instead of in your discard pile - it lets you immediately show off your new free agent signing! The next thing that I like about Blood Bowl is that it scales well between 2-4 players. (Obviously, it does take a lot longer with 4 players than with 2, though.) You use a number of "highlight" cards (the cards you fight over) based on the number of players - 2 player, 2 highlights, and so on. This means that you are normally going to be fighting over 2 highlights (and possibly a tournament) regardless of how many people are playing. With more players, you occasionally have the opportunity to try fighting over a third highlight, but this normally stretches you so thin that you lose all of them. There's also not much sense of "ganging up" on players since each highlight can only have one player on either side. Overall, it balances player interaction very well, and prevents much of the normal "everyone against the leader" gameplay that is in many other games. A third pro that I think is brilliant is a very minute rule in the game. After each person collects all of their booty at the end of each week, they take turns reading their new cards and their abilities to all players. This is really a trivial rule, but it is one that I think more games should implement. It cuts down on most (if not all) of the reaching across the table to grab each other's cards to see what they do. Brilliant! It's amazing how useful such a minor rule can be. The last couple of pros that I will mention are that I like how the tackling works, and I like the different abilities that players have (and how this gives each race a much different feel). When tackling, you always have the chance of falling down. However, those odds are adjusted based on how big your player is compared to theirs - if yours is bigger, roll two dice and pick your result. If they're the same, roll one die. If yours is smaller, roll two dice and they pick the result (a die has 3 tackles, 2 misses, and 1 fall on your face). With the different factions, each faction seems to be better at different aspects of the game. Skaven are good at Sprinting, Dwarves are good at Guarding, Chaos get fans for injuring players (tackling a downed player - it removes him from the highlight). Plus, they included six races for a four player game. I love it when game companies provide you extra things out of the box to enhance replayability instead of always trying to force you to buy expansions. Yet, with all that I love about Blood Bowl, there is one main con that I have about the game - it feels much longer than it should. When you read about the game, look at the game, and see the game, it looks like it should be about an hour long game. Unfortunately, it normally takes two hours (or more). There's not a lot of down time, so I'm not saying that the game drags on a long time and feels boring. It simply takes longer than you think it should - and occasionally you will feel that the game is dragging. Of course, the more you play, the faster you will be - since you'll be familiar with all the cards and rules, but it still seems like it should take an hour. My other con, that I touched on earlier, is that I wish that they hadn't implemented the building of your team with a deck building mechanic. It doesn't really detract a lot from the game, but I think I would have preferred each team having "positions" (like in real sports), and when you get a new Star player, you are replacing the one in that position. This would also mean that getting a Star player isn't always beneficial - if you gain one for a position where you already have a star, then your new player doesn't help. 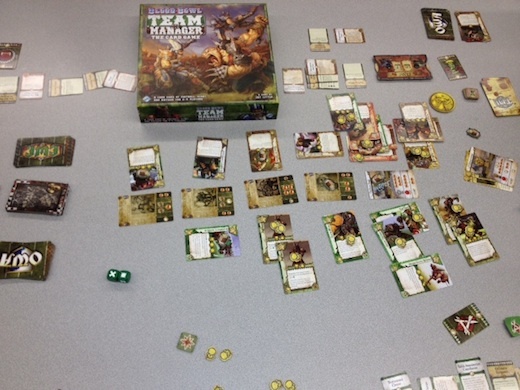 Overall, I give Blood Bowl: Team Manager an 8.5/10. I enjoy the game, and I am debating whether or not I need to add it to my collection! It's hard to explain who all would like this game. So, I guess I'll simply say - if you've been looking at this game and it looks appealing to you, go out of your way if needed to try it. I think you'll find that it is a very good game, and, though it might not fulfill all of your wildest fantasies, you probably won't be disappointed. If Blood Bowl: Team Manager sounds interesting, then you might also check out Star Wars Living Card Game, Race for the Galaxy, and Glory to Rome. Now for a quick little review of a small card game expansion, let's talk about Lunch Money: Sticks & Stones . As many of your should know (if you read my Lunch Money Review), I really enjoy Lunch Money - probably way more than anybody else, and definitely way more than I should. Because of this, I bought the Sticks and Stones expansion; but, also because I like the base game so much, I didn't bother incorporating the new cards in until recently. And, lo and behold, they added enough to the game that I should write about them. Instead of talking about pros and cons like normal, I will highlight some of the new cards (this is really all that changed) and tell you what I think of them. Abandonment: this is probably the best addition to the set. In the original game when your opponent had Humiliations in their hand, there was nothing you could do about it but sit there and be sad while waiting for them to slaughter you. Now, you can play Abandonment and force them to discard their entire hand (and it can't be Humiliated). Definitely a nice addition to the game. Backlash (which looks like "Backlask" in my set): this card is also awesome. It is a new defense card similar to Dodge/Block, but instead of canceling the damage, it reverses it and does it to the person who played the attack cards. This card is incredibly powerful, but aren't the powerful cards the ones that make the game fun? Another wonderful addition. Tantrum: Deals 5 different attacks of power 1. Very fun... when played on others. Much less fun when played against you. Hippie: Name an opponent to be a "hippie" which lets all the other players attack them immediately - great in big games, pointless once it is down to 2-players. Faster: Plays alongside a block/dodge to work for all the blocks and dodges needed that turn. This card is very important because of the addition of Tantrum and Hippie. Imaginary Friend: After resolving your first attack, get a free basic attack. Sweet! what's not to like? Spank: Power 2 special attack that can only be played after a grab. This card seems really useless to me, and is by far my least favorite card from the set. There are also other new cards including basic attacks, Wedgy, Chunk, Nuts, Time Out, Weird, 2-fer, and probably some others. The main downside to the expansion (which is also the main downside to the base game) is that you have to just learn what all the new cards do - there's no iconography or any other way of knowing what a certain card does other than looking it up in the rules repeatedly until you memorize it. Overall, I give Sticks and Stones an 8.5/10 as an expansion. I obviously do not think that it is better than Lunch Money, because you can't even play it without Lunch Money. However, now that I have started playing with it, I think that I will keep Sticks and Stones mixed in with my Lunch Money set and keep beating the snot out of my friends in glorious new ways! November 22, 2011 is the six month anniversary of tornadoes devastating the city of Joplin - so I figured it might be a good time to give you guys an update of what all has happened since that date. A lot of rebuilding has taken place. Commercially, Wal-Mart, Aldi's, Walgreen's (two locations), Wendy's, Chick-Fil-A and several other stores have been rebuilt and are already open. It's really amazing to think of some of these and how quickly they were rebuilt. Chick-Fil-A was one of the fastest. I believe that it reopened it's doors (after being completely leveled and rebuilt from the ground up) on September 1. Most of the debris haul off has happened. There are still pockets of debris around the city - such as St. John's hospital and Joplin High School, which I believe are both still standing in roughly the same condition as when they were initially hit. The government helped pay for the Army Corps of Engineers to come and oversee this cleanup - specifically for the residential districts. It was impressive to see how quickly the residential debris was removed. Many people's houses have been repaired. Not everyone by any means, but every day you hear about more people who have finally completed the last repair on their house - whether that is the windows, the carpets, the roof, the ceilings, or something else. Construction crews are still backlogged between the repairs and the new construction, but you can see that progress is being made. Speaking of new construction, there are several new houses that have been completed. It's very odd to drive along a street that used to have a neighborhood on either side and see a brand new house standing every few streets (with nothing in between). One area that the city of Joplin has done a remarkable job with is their public schools. School was started on time! The High School is temporarily located inside of the mall. The Elementary schools have been shuffled around, but all Elementary students are still attending. Something else that Joplin is doing is that they are busing in students who were relocated in the surrounding areas (I don't know if this is still going on, but I had heard that it was at one point). If you were in Joplin public schools before the tornado, then you are allowed to stay enrolled in Joplin public schools now - regardless of what city you are actually living in at the moment. This means that kids can continue attending school with their friends, which I think is important. So, a ton of you sent me games to keep after the storm, or to give to others that were affected. I did my best to find great homes for them (sometimes that meant mine ; ) )! If I were to estimate, I would guess that I received between 100-150 games after the tornado (ballpark guess). I gave them away to everyone I could find that was affected and that I knew played games! The distribution centers were all swamped with donations, and so they would not accept any from me (those of you that mailed games in, don't worry, they didn't turn these down). My friends who run Hurley's Heroes had the same situation that I did, but with comics that were sent to them. This hit the local news, and the Hurleys set up a day that they would open their doors and anyone could come pick through the comics that were donated and take any of them for free! I strong-armed them into letting me give games away at the same time! (It didn't take much convincing - they are very generous people.) I gave away an estimated 25-75 games just on that one day (I don't really have a "record keeping technique"). My favorite quote from all of this was when I heard a lady that had grabbed 3-4 games say "this is going to restore game night at my house." That was wonderful! And, when I kept eavesdropping, I realized that her house was only a block from where mine was. Hers must have been completely demolished as well. So, my wife and I have had an interesting journey. From May 23 - (approximately) August 1, we stayed with friends. We bounced around a decent amount during this time, and even went down to Houston to stay with my best friend from college for a bit. This was a very trying time for both of us, but I believe it was much harder on Anna than it was on me. She struggled a lot during this time, as nowhere was ever home. On August 1 (Monday the week of GenCon!) we were able to move into our friend's garage apartment. It is quite nice, and more than anything, it was nice to actually have a place where we can stay, pay rent, and feel like we're not imposing. He was gracious enough to leave it furnished so that all we needed to bring was a bed! This really helped us, as it allowed us to wait until we knew what we were doing longer term before buying things like furniture. This is where we are currently staying. Life gets crazy sometimes. I'm very glad that my wife has been by my side through all of this, and hopefully I have provided her some strength, too. We continue to both be incredibly grateful that we were on vacation when the tornado hit - some of our neighbors have told us that they are still having nightmares, and I would imagine that this will continue for quite some time. I want to thank you all for the support that you sent me to help with the tornado, the games that you sent, the prayers that were raised, and just sympathizing with our city's pain. Tons of people that I've never met also came to Joplin to volunteer - I want to thank them. More than anything, thanks for caring about people that you have never met. If nothing else, one of the main things I've learned through all of this is that, just because the news has stopped covering something, doesn't mean that the pain has stopped. Now let's get back to board games! Some games you just hear so many good things about that you are forced to try them yourself. Le Havre was a game like that for me. Le Havre is all about money. Whoever has the most money at the end of the game is the winner. Each round consists of seven player turns. Each player (on his turn) will move his ship to the next "supply tile", thus adding more goods to two of the "offer" piles. After this, the active player can perform a single action - he can either take all of the goods from a single offer pile, or he can move his piece to a building, thus performing it's action (you must move your piece - thus you cannot use the same building twice in a row). Other things that a player can do on his turn (that don't cost an action) include buying a building, selling a building, or repaying a loan. After the player has performed his action, play moves on to the next player. Once the seven player turns are completed, the round ends (notice that each player will not get the same number of turns each round), and the players are forced to pay a certain amount of Food (or take out a loan to cover the missing Food). Play continues with the next player's turn and the game continues until all of the rounds are played. After all the rounds are played, each player gets one final action (in which they make as much money as humanly possible and can use a building that has an opponent's piece in it). Finally, all that remains is adding up how much money a player has between cash on hand and value of buildings owned. The first thing that I like about Le Havre is that all player's don't have the same number of turns each round. I don't think that I've ever played a game with this mechanic. Yes, it may feel a bit unbalanced if you don't get as many turns in a round where you are desperately trying to accomplish something. But, the game is setup so that each player has the same number of turns in which he gets an extra action, so the game does actually balance out fairly for all of the different players. Learning to capitalize when you have an extra action (or still manage to get enough food when you are short an action) is a key factor in winning the game. The next thing that I like about Le Havre is that all of the options available to you for your action are good actions. The key is in finding which action is the best action. For example, there will be some turns in which you are able to collect six or more Fish (one of the goods, which also provides one Food) from the "offer" space. However, do you need six Fish? They help to feed your people, and that is crucial - but does having six Fish right now help more than using a building that allows you to get different kinds of goods? Or the building which lets you build more buildings? There are very few "bad" options - but whoever is able to capitalize the most on his opportunities will ultimately become the victor. 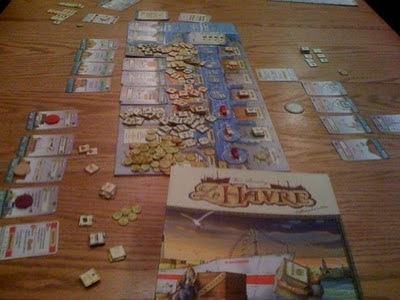 The third pro that I will mention for Le Havre is how carefully balanced the game (and even it's setup) is. The game is setup differently based on the number of players and whether you want to play with the "full" or the "shortened" version of the game. This ensures the balance of the game, and also ensures that the buildings that are needed appear in a timely manner. You can really feel the hours of playtesting that went into the game. And, speaking of different variants, I really like that you can play a "full" and a "shortened" version of Le Havre - and that both feel like good gaming experiences (you don't feel like you're playing a broken version of the "real" game if you play the shortened version). You can tailor which version to play based off of how long you want to play the game, but either game that you choose will still give you a high quality gaming experience. The last (detailed) pro that I will mention is the option to both buy and build buildings. This is an example of Le Havre having "multiple paths to victory." (This means that players can have completely different strategies, and yet each strategy has a very valid chance of winning.) The buildings, as an example, can be built by a player who has done a good job of acquiring different resources - which can be challenging. And yet, a player who has done a good job of acquiring money (which is also hard) can just buy the building, and thus still gain the benefits of it (though without having an immediate net gain of victory points - buildings are never worth more victory points than their cost to purchase). The game components are designed well so that each "goods" piece represents two different "goods"
However, with all of that said, Le Havre has a glaring con: Analysis Paralysis. (This is the slang term for when a player has so many options that he can't decide what to do, thus horribly slowing down the pace of a game - and often annoying all of the other players.) I personally am normally not one to subdue to Analysis Paralysis, but I have found myself struggling with this in Le Havre. Early in the game there are only a few options, and thus there isn't much of an issue. However, starting about halfway through the game, there may be 20 or more options. And, do you remember that I said that all of the options are good options? This is really what causes the paralysis to occur. It's pretty easy to eliminate most of the options as "less good", but that still leaves 3-4 very good options that a player will have to decide between. Though each player is only performing one action on his turn, the amount of time to decide on that action may take quite a while to determine. Maybe we should play it with a chess timer... but then I'd have to get a chess timer.... which could be cool in itself. Overall, I give Le Havre a 9.5/10. I debated only giving it a 9.0, but I do think that it deserves a 9.5. When I think about the number of pros that I am able to name for the game without really even pondering for very long (and the fact that the only con I came up with is "people think too long"), it's hard to not give it a score that is almost perfect. If you're a fan of games like Puerto Rico, Agricola, and Caylus , I would definitely suggest Le Havre. A game that I bought last year while vacationing was Wyatt Earp. Wyatt Earp is basically rummy with special cards. However, more specifically (in case you've never played rummy), here is what you do each turn... You may draw 2 cards from the deck or the one card on top of the discard pile. Next, you can play any number of cards from your hand (but only one Sheriff). 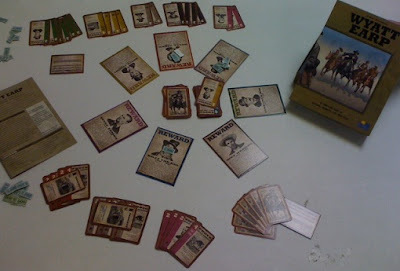 When playing cards from your hand, the first time each "set" of outlaw cards is played, there must be at least three played (playing cards also puts reward money on the outlaws) - after that, you may play any number of them at a time. Finally, you must discard a card from your hand. This continues until the deck has run out twice or until a player runs out of cards in his hand. At this point, most of the robbers (based on what was played) are scored, with most of the money going to the player with the most "capture points" for that robber. Rinse and repeat (until someone has $25,000). The first pro for Wyatt Earp is that it is a pretty fun, laid back game that basically anybody can play. (After all, you start the instructions with, "have you played rummy? Then you basically know how to play.") I like rummy; and so I like Wyatt Earp. It's not really a complicated game, but it can be fun to play with your non-gamer friends (and your gamer friends that need a break from strategy games). The next pro for Wyatt Earp is the Sheriff cards. These cards are really what distinguish the game from rummy. Some of the things that Sheriff cards can do include: "hiding" your opponent's card set for a given outlaw, add points and/or money to an outlaw, draw extra cards, and ask an opponent for a specific outlaw card. These really do help the game, but do not really provide a drastic change - the primary cards that will be used include the "Hideout" (which hides an opponent's card set for a given outlaw) and "Wyatt Earp" (which counters "Hideout" or lets you draw extra cards). Now for the main con for Wyatt Earp: the box is too big. Now, I realize that you're probably already thinking "really, that's it?" or "but this box is smaller than 90% of my game collection." You're right; however, compare it to a normal deck of cards. If I were to play Wyatt Earp without the Sheriff cards (we call this "rummy" - have you noticed a theme? In case you missed it, the theme is "Wyatt Earp is rummy"), then I would only need a standard deck of cards. A deck of cards is way smaller than Wyatt Earp (easily fitting in my pocket) and is also much more versatile (I can play Bridge, Euchre, Spades, Hearts, Pinochle, etc). Therefore, I'm probably not ever going to carry around Wyatt Earp - and since I don't carry it around, I'll never wind up playing it. Now that I've typed all of that, I'm going to give up on this review. Hopefully you know enough about the game (it is rummy) that you can decide whether or not you like it (do you like rummy?). That's really the point of these anyway - to let you know whether you would like a game or not, and to let you know why I do or don't like it. Hopefully you have enough information to make that decision by now. Overall, I give Wyatt Earp a 7.5/10. It's a fun game. However, again, I can play rummy with a normal deck of cards, so I'm going to wind up getting rid of my copy. If Wyatt Earp sounds interesting, you might also check out Dixit, Glory to Rome, and Innovation. In Gloom, each player controls a family of soon-to-be miserable people. The object of the game is to make your family as miserable as possible... and then to kill them. Each turn consists of playing 0-2 cards and then redrawing your hand back up to 5 (if it was less than 5). The cards that you play can be on any character in play that is still alive - whether they belong to you or another player (but only the first card played can kill a character). Once one player has killed off all of the members of their family, the game is over, and the person with the most miserable family (only counting the dead family members) is the winner. 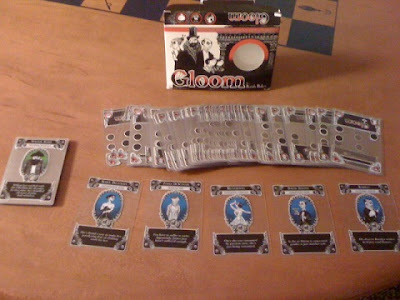 Gloom's first pro is its portability and ease of play. It is a small card game that can be explained in about 5 minutes or less (if you read the previous paragraph, you know most of the rules). Because of this, it makes it a good filler game for whenever you have a little extra time, wherever you may wind up (at an airport?). The next pro to Gloom is in the transparent, stacking cards. I have seen this type of card elsewhere (in Hecatomb), but it is done differently and with less confusion in Gloom. Each of the cards is transparent, and there are 1-3 different modifiers on most cards. The modifier cards are placed on top of a character (and each other), and whichever modifiers are visible once the new card is played are the ones in effect. Therefore, if your opponent has a -30 on one of his characters in the middle spot, you can bring joy to his family member by placing a +10 on top of him. If this covered the -30, the +10 would replace the -30. The final pro to Gloom is that the flavor text is quite amusing. I haven't read all of it, but the creators seemed to put some thought into the names of the cards as well as the characters. For example, the family that I played was a group of failed circus freaks such as the "Bearded Man". The first con to Gloom is pretty obvious - not everyone will want to play a game about making people miserable and then killing them. More specifically, many people will not want to teach their children a game like this (of course, not everyone is this way, as my friends taught this game to their children at age 8). This has nothing to do with gameplay, but you should be aware of it when deciding whether you want to buy the game. The next con is that the game isn't really all that complicated, and so it can become fairly repetitive. Every round will consist of doing very similar things - making your family miserable, bringing joy to others, or killing off characters. Because of this, it is important to not take this game seriously. It should be played as a conversation piece more than as a game itself. It can be fun, but it will not keep your mind very engaged. Overall, I give Gloom a 7.0/10. 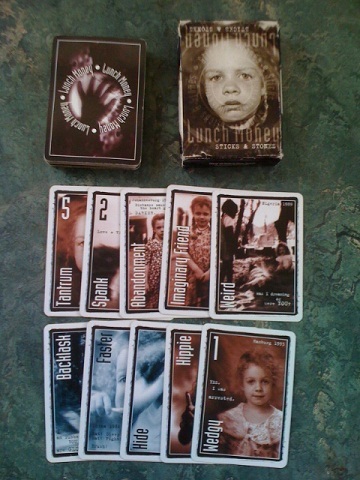 It is a good little game, but I have several other card games that I prefer (like Lunch Money). If a friend brings Gloom with them and wants to play it, I will probably be willing, but I don't anticipate seeking it out. If Gloom sounds interesting, you might also check out Jab: Real time boxing, For Sale, and Dixit. One of the hottest games that's been "abuzz" on the Internet recently has been Eminent Domain (that link takes you to Tasty Minstrel's store, or this one is for Amazon. The first thing that I love about Eminent Domain (which I have never seen in any other game), is that you get better at your role as you keep doing it! Yes, this is implemented in a deck building mechanic, but I think that Eminent Domain feels much closer to Race For The Galaxy than it does to Dominion. The deck building is really just a means to an end. What is actually happening is that the game is rewarding you for continually choosing the same role. Are you a warmonger? If you repeatedly select this as your role, then you will gain more Warfare cards - which, in turn, allows you to have more at your disposal in future turns. This means that when another players chooses to play Warfare, you will quite likely be able to gain more Fighters than they do, even though they selected the role! This is a really awesome mechanic, and yet it makes complete sense. Another inventive mechanic in Eminent Domain is the option to dissent. I love this! In every other game that I have played that has "roles", one of the best strategies is to select a role that helps you and nobody else. Whereas this is still a sound strategy in Eminent Domain, everybody else in the game will still get some benefit on your turn, it just might not be as much. Also, because of the option of dissenting, it adds another layer of choices to the players that are not the leader. If a player in front of me chooses the Warfare role (and I was planning to as well), should I follow suit, allowing me to select a different role on my turn? Or would it be better to draw an extra card and hope that it is a Warfare - thus making it more effective when I select the role? I like these additional decisions. The next thing that I like about Eminent Domain is that the planets that join your empire help you in various ways. This is honestly why the Survey is important - it allows you to look at more planets to select the one that most fits into your plans. Planets can help you by giving you victory points, allowing you to research more technologies, allowing you to produce resources (to trade), increasing your hand limit, and by displaying icons for the various roles (thus acting like you had played a card with that icon, even if you don't have one in your hand). I really like this added level of depth to the game. The final that I like about Eminent Domain (that I will tell you about) is that the Research action can be incredibly valuable, but it does not seem overpowered. I have played a lot of games in which there are new technologies available. Normally, if a player does not focus on getting the best technologies he has no hope of winning the game. Eminent Domain is not like this. In Eminent Domain, Research is very valuable - it can give you bonuses like allowing your Research cards to act like any role card, and also give you victory points. However, since it is slower to get started (each research has a number of explored worlds that you must own before you can acquire it), it is simply one option when trying to win - not the only option available. Ok, two more final pros - but I'll be brief, I promise. I like that when selecting a role, what is in your opponents' hands are secret - this means that you have no idea what the other players will be able to do after you select your role (as opposed to Puerto Rico where all information is public). I also like that the more success you have on other people's turns, the more limited your options are on your own turn - thus it's not always beneficial to use all of your Colonize's on an opponent's turn - having one left may be important. One thing that you should know about Eminent Domain (before moving on to cons) is that it plays quite differently based on the number of players playing. It supports 2-4 players, and I have tried it with each of these configurations. I have enjoyed all of the games, but they really work out quite differently. In 2-player, you have much more influence over your own destiny - you get to select half of the roles in the game! In 4-player, you are often dissenting, as you will often not have the card(s) to make it worthwhile to follow the leader's role. Research is quite easy in 2-player, whereas in 4-player, it is hard to get the Research working, since you have to still acquire the planets before you can research (and by the time you acquire enough planets to gain good technologies, one of the piles (Colonize or Warfare) is probably close to exhausted). Again, I like the game with any number of players, but the feel is quite different between them - almost like playing a different game that uses the same pieces. My biggest con about Eminent Domain is that my copy wasn't quite to the level of production quality that I would have liked. A few of the starting planets were scuffed when I opened the box (not a big deal, though somewhat annoying), but more importantly, my cards shuffled, but not especially well - which is a major nuisance in a deck building game! It makes me sad to have to tell you this, since I know that production quality is at least as important to Tasty Minstrel as it is to the people that buy their products, but it is true. Since I know the importance they place on quality, I imagine that this will be fixed in a future print run, so it shouldn't be a problem going forward. In all honesty, I just went ahead and sleeved all of the cards that could be placed in my deck (roles and technologies), and this helped with the shuffling problem (and probably extended the lifetime of my game). If I can spend about $5 to fix the biggest con in a game that I love, that's not a bad trade. The final thing that I will mention (and I will list as a con, though I'm not sure it shouldn't be a "point of note") is that some of the roles (such as Produce and Trade) do not receive a leader bonus in 2-3 player games. Specifically, they get their leader bonus when the deck runs out. However, in a 2-3 player game, this is the end of game condition. I thought that this was odd - it didn't really hurt the gameplay, and all I can imagine is that in playtesting they determined that these roles were overpowered if you got a leader bonus too early on them. It was weird - again, not a major thing, just something that I found strange. Overall, I give Eminent Domain a 9.0/10. I really enjoyed this game. I thought it was innovative and took mechanics that I already enjoyed and made a fresh and unique gameplay experience from them. I would highly recommend that everyone try Eminent Domain if you have the opportunity - whereas even if it does not become your favorite game, I think you will at least enjoy the time you spend playing it. If you like Eminent Domain, then you might also enjoy Puerto Rico, 51st State, and Star Trek: The Next Generation Deck Building Game. 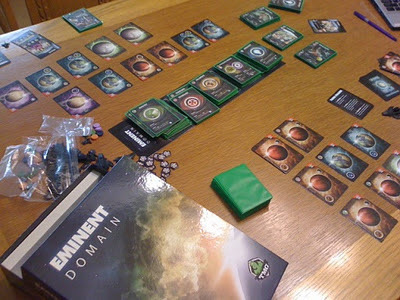 I would like to thank Tasty Minstrel Games for providing me with a review copy of Eminent Domain to play. 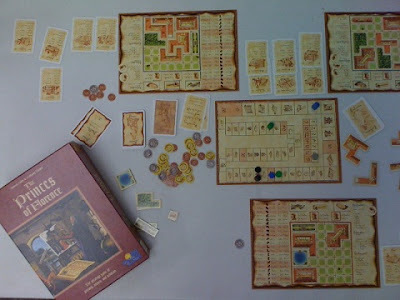 Here's a game that was very highly rated on the 'Geek, so I decided it'd be nice to try and thus traded for it: Princes of Florence . In Princes of Florence, each player is trying to score the most "prestige points" (victory points) by (primarily) creating the most impressive works. To do this you must (of course) hire amazing artists... and what makes an artist amazing? In this game, it is by making them happy by meeting certain criteria (like having the correct building, landscape, and freedom in your kingdom, as well as having other artists and jesters). Each turn starts with an auction - this is where you can buy landscape, jesters, bonus cards, cards that re-use other player's artists, and builders. After the auction, you are able to take a couple of actions - this is where you can buy freedoms, hire new artists, have your artists create a new work, build buildings, and a few other things. Whenever you create a new work, you immediately get an amount of money equal to it's "Work Value" (calculated based on how happy the artist was, and which must be at least the minimum "Work Value" for that round), or you can trade in some or all of the Work Value for victory points (and the person with the nicest work each round gets a bonus 3 Victory Points). There are a few other rules that I won't bother covering, but this is the gist of the game - it continues like this for seven rounds, and then whoever has the most Victory Points (after playing the "Prestige Cards" that you can buy in an auction) wins. There are several things that I really like about Princes of Florence, but here is where I will start: the random draws are not very random. Any time that you draw a card from one of the decks (whether a Prestige card during the auction or an artist or bonus card as an action), you get to draw 5 cards and choose one of them. This helps you to actually be able to develop a strategy; instead of simply drawing a card (telling yourself, "oh crap, that's not helpful") and trying to work it into a strategy, you can have a strategy going into the action, and normally gain a card that is actually able to help based on what you have done in the game to that point. This is amazing coming from so many games where I simply draw one card and almost always wind up drawing several useless cards throughout the game (several of which will still be in my hand when it is over as a monument to wasted actions). The next thing that I like about Princes of Florence I will briefly describe as the game being "tight". The more long-winded way of saying this is that I like the fact that I can't do everything that I want to do each turn. Ideally, you will have the correct building, landscape, and freedom (and some bonus cards) before playing a work - after all, this is how it scores the most points! However, that's often not plausible, because if you wait until you have all of that, you will probably only build about one work per game. Therefore, you have to decide which works will have to be built without scoring full points. This tightness factors in both in the auction and the action phases of the turn - because there are several things that are incredibly valuable in the auction each round, but you can only buy one thing per turn. You wind up having to decide, do you want an advantage in buying buildings? Do you want a Jester which adds 2 to any work? Do you want a Landscape to be able to add 3 to certain works? These decisions of what is the most "bang for your buck" are the true heart of the game, and they show that it was very carefully balanced and playtested. And I enjoy the very slight frustration that it gives me to have to decide not to do one action in order to do another one that is ever so slightly better. Another thing that I like about Princes of Florence is that it is up to the players to keep the game balanced. Specifically, in the games that I have played, if a player is able to get a Jester each turn (without paying thousands of dollars for it), he will often run away with the game. This is because each Jester adds 2 "Work Value" to a work - so if you have enough Jesters, you don't really need to worry about any of the other conditions on the card. However, the Jesters are only acquired through the auction. I would imagine that the designers of the game knew how good the Jesters could be, and that's why they only let you acquire one by outbidding your opponents (and only one can be sold each round). Therefore, it is up to the other players in the game to make sure that no single player winds up having 6 Jesters by the end; because if a player has that many, he will probably win the game (and it won't even be close). An interesting aspect of the game that I will list in the "pro" section is this: the minimum "Work Value" to create a work goes up each round. This forces players to actually play with more strategy to determine how they are going to be able to create works both early and late in the game - this also factors into the decisions of whether you should hold onto your work until later in the game when everything is matched, or whether you should play it earlier and start working on the next one. I didn't ever really feel like this was a huge part of the game, but I do think that it is a very interesting little aspect that they added. The final pro that I will mention is how important money management is in the game. There are two ways of getting money in the game - when you build a work you gain money, or at any time you can sacrifice victory points to get money (but you paid 200 per victory point and you sacrifice them for 100 per victory point). At the end of the game, additional money is useless. However, most actions in the game require money (aside from creating a work). Therefore, the player that is able to most carefully ensure that he has enough money to do everything that he needs to do, has enough that he can buy what he would like in the auctions, and doesn't have too much extra money at the end, will have a distinct advantage. Another note that I will add to the game that isn't really a pro or a con is that there really isn't "that much complexity" (relatively) to this game (note I said "complexity" and not "strategy" or "depth" - there are tons of both of those). Whereas some games have millions of options throughout the game, and each card drawn is unique and opens up more possibilities, Princes of Florence really isn't like that. The cards in Princes are all very similar - all the Profession cards (works) have the same basic things, but are different based on what makes the artist "happy"; there are a few different bonus cards, but they are all based on the handful of things you would do anyway, and the same with Prestige cards. This means that once you catch onto to how the game works, it can probably be played in around 45 minutes, and yet has a lot of strategy through determining how to spend your actions and some highly important player interaction through the auction. However, people that really love games where the depth of the game lays in the cards each doing something unique and "breaking the rules" of the game will not see that element here. Overall, I give Princes of Florence a 9.0/10. I was quite pleased with how my trade ended up, and I plan to keep Princes of Florence (and keep playing it) for quite some time. Unless you have some significant aversion to auction mechanics, or to games that mention art (yeah, it's about "creating art", but only sort of), I highly recommend you trying this game. If you like Princes of Florence, you might also check out Puerto Rico, Tigris and Euphrates, Power Grid, and Phoenicia. 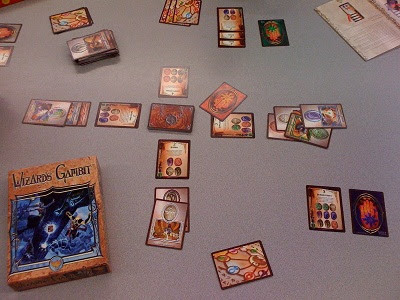 A little card game that I stumbled upon relatively inexpensively was Wizard's Gambit . In Wizard's Gambit, each player takes on the role of a Wizard who is attempting to learn the most powerful spells (specifically 10 points worth of them). Throughout the game, there are 4 spells available in the "spellbook" (common pile in the middle). To learn/cast each spell, different elements must be played, such as "Dragon's Tooth", etc (depicted by symbols and colors). Each turn, the active wizard is allowed to play one "incantation" (action card) and must play one element (or show his hand revealing none available that match what the current spells in the spellbook require). Each time a Wizard completes a spell, he puts it on top of his personal spellbook, and its effects begin immediately (and replace any previous spell in his spellbook's effects). The game continues in this manner until one player has scored 10 points. There's not really all that much to be said about this game, so this section may be a bit brief. The main pro was based around trying to time your card plays for their maximum potential. This normally involved incantations much more than element cards. With element cards, the goal was essentially to not place the next to last required element (because then the next player could complete the spell). However, with some of the incantations a player could wind up performing some interesting actions on his turn and score significant points by completing one (or potentially more) spells. The next pro is related to the "Gambit" cards. These are the trump cards in the game, and you could use them for 3 purposes: to block other players from playing on a spell in the common spellbook, to block the effects of a spell on top of somebody's spellbook, or to cancel someone else's Gambit card. They helped the game to have more interesting strategies because a player had to determine whether it was important to protect one of the common spells, keep the Gambit as defense, or block an annoying spell effect. Unfortunately, the Gambit cards are removed from the game once they are used, so you will only see these cards the first time through the deck. Now for the cons, starting with... the primary game mechanic turned into "who can wait the longest." The object of the game is to play the last element in each spell. Because of this, your turn is often no more than looking around and making sure that you don't play on certain spells - you don't want to set the person after you up to be able to collect a spell. The incantations and (previously collected) spells help with this, but the sentiment is definitely prevalent in the game. The next con is that it was not easy to see which elements were remaining on any given spell. Because of this, players regularly were forced to repeatedly cross off the played elements in their heads to determine what was remaining. This caused the game to take longer than was necessary. Finally, the game was not especially fun. I think that if it played faster, it would have been quite a bit better, but the pace of the game was a bit too slow for the complexity and level of enjoyment involved. Overall, I give Wizard's Gambit a 6.5/10. It isn't a bad little card game, and it could be played with just about anybody (read "kid friendly" - as long as they can read), but it just doesn't hold my attention for long enough to play it very often. If Wizard's Gambit sounds interesting, you might also check out Dixit, Gloom, and Glory to Rome.